Rush Limbaugh: Democrats Exploit Tucson Shooting : It's All Politics Limbaugh accused Democrats of welcoming the attacks in order to put Republicans on the defensive. The attacks gave Democrats an opening to go after him and Sarah Palin. The news media came under heavy criticism from Limbaugh. So much for the Tucson shootings perhaps being a chance to reset the nation's political debate. 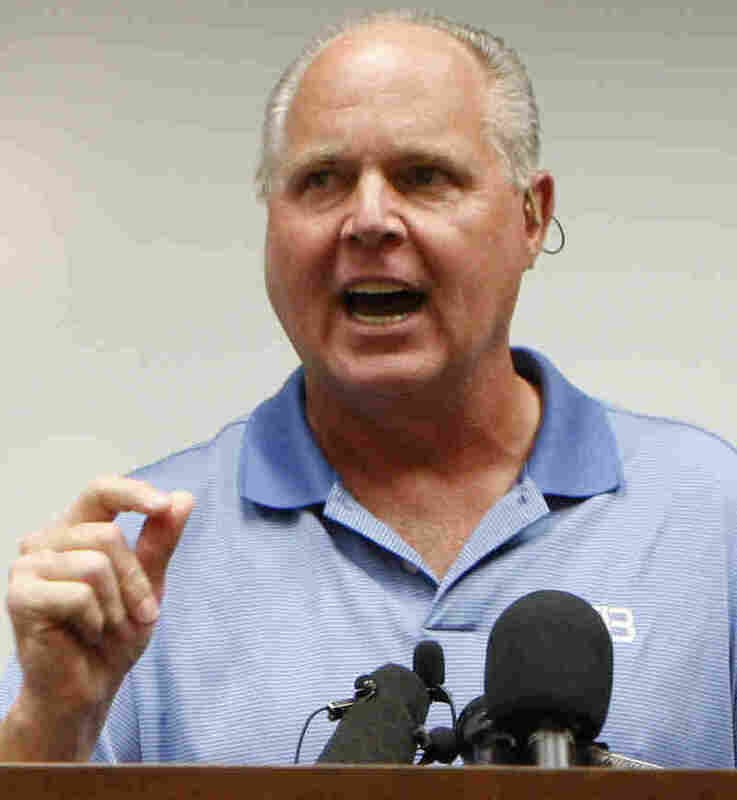 Rush Limbaugh on Monday accused Democrats of trying to exploit the Tucson shooting rampage. And the first thought, the desperate hope that the losers in November of 2010 had, was that they could revitalize their political fortunes because of this unfortunate shooting of a congresswoman in Arizona. That was the most important thing to them -- and that, to me, is sick. You know that they were rubbing hands together. You know that they were e-mailing and calling each other on the phones saying, "A-ha, this might be the one! This might be the one where we can officially tie it to these guys and shut 'em up and shut 'em down." They want you to believe that sadness was on the order of the day, and I'm sure it was, but the opportunity! They couldn't help themselves. They just couldn't help themselves. Their first objective and first priority was to try to make an association between this nut and Sarah Palin. What? That's absolutely... You talk about insane? This guy doesn't know Sarah Palin. She doesn't know him. The really weak, flimsy, balsawood-type attempts to link this guy to Sarah Palin? The difference is that a majority of the American people don't buy it. The difference today and 15, 20 years ago is these people on the left are now seen by a majority of Americans for who they are and what they are. They can't sell what they have to sell. Real question: Who are the parents of this kid? What kind of a job did they do raising this kid? Are the parents derelicts? So what? This guy spends time on the Web surfing and so forth. Really? If people on the right and Sarah Palin and so forth are responsible for all of this and this "vitriol" and "rhetoric" is so pitched, how come this isn't happening every day? Limbaugh's comments obviously are only going to spin up the partisan charges and countercharges in the days and weeks to come.